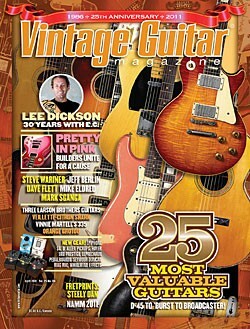 We feature the 25 greatest guitar songs of the ’70s, as chosen via a poll at VintageGuitar.com. We also review the greatest guitar tracks of Gary Moore, along with previously unpublished interview with the Irish guitar hero who passed away February 6. We also tell you about an amazing exhibit of stringed instruments at New York’s Metropolitan Museum of Art, which is highlighted by three particular archtop guitars. George Gruhn and Walter Carter detail how the Epiphone Soloist Emperor was created in a time when its builder was in a heated battle with Gibson to determine who made the biggest and best archtop. Then, Michael Wright talks about the unconsciously-retro Espana EL-31, Willie Moseley extolls the virtues of the Harmony H44 Stratotone, and Dave Hunter gives us an up-close and personal look at a 1982 Dumble OD Special played by Robben Ford. Robbie Calvo. Wolf Marshall breaks down three of the coolest licks ever recorded by Joe Perry, and we tell you who jammed with who at this year’s Deke’s Guitar Geek Festival. If it’s time to upgrade your gear, take a look at our reviews of the Reverend Rick Vito, the Bluesman Vintage 3-Speed Coupe, K&K Meridian Pro, the Naylor Heads-Up Strap, MTD Kingston CRB/Saratoga basses, and the TC Electronic BH500. All this and much more are in the May issue of VG. There are few collectibles in modern pop culture that are as cool as guitars. They’re functional, tactile art that inspires players and music fans alike. But beyond fond memories, for some, guitars serve as investments. Here’s a look at 25 guitars that, thanks to certain players, songs, and the laws of supply and demand, have become exceedingly valuable. 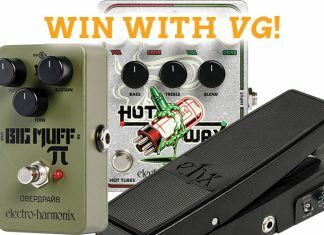 Win a b3 Metal-XS guitar and Two-Rock Studio Pro amp valued at $5,594, from Premier Builder’s Guild! Fretware Turns 40, Archtop Builders Exhibit, Mississippi Honors Wilder, Saint Blues Suspends Imports; In Memoriam, More! CD and DVD Reviews: Drive-By Truckers, Jinx Jones, The Grascals, The Doors with Albert King, Star Guitars, more!